We have the technology, and the time is now: We can roam alleyways from a cat’s POV. 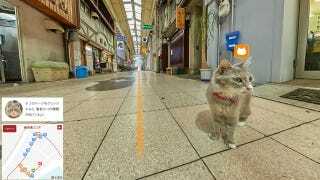 Onomichi, a city in Hiroshima prefecture, is rolling out Hiroshima Cat Street View. As the name implies, it allows internet users to scope out Onomichi’s shops from cat height. If you speak Japanese, you can click on the store icons in the lower lefthand corner and get basic information about each shop — like what it sells or a link to the store’s Facebook page. You can also look for the pawprint icons to discover shops where different furry friends hang out. According to the Wall Street Journal, the Hiroshima Tourism Board has plans to debut cat maps in more cities next month. It’s kinda gimmicky, it’s sort of artistic, but might it even hold more practical applications down the road? Maybe animals could reach places we couldn’t, and we could create a map with captured images? Or, you know, we can just geek out on the internet and pretend we’re cats in Japan. That’s fine too.